Hidden within the Namizimu Forest Reserve, an abandoned forest estate is being slowly refurbished and improved to create a peaceful and relaxed sanctuary high in the mountains across the Shire River. Namizimu Forest Retreat is an oasis of peace and tranquillity. In a part of Malawi with virtually no tourists and zero visitor infrastructure, we offer the only visitor accommodation available on the South Eastern side of Lake Malawi. 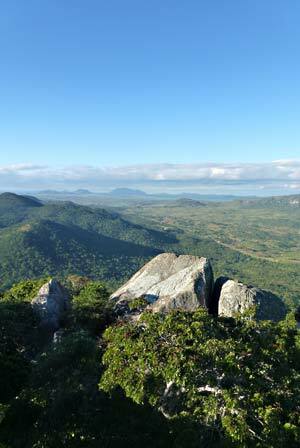 Our elevated position, 1500 feet above the lake, provides one of Malawi’s best view points, offering a huge panorama all the way from Zomba Mountain to Cape McLear. If you enjoy peace and quiet, in beautiful natural places, you will enjoy the indigenous forest setting and the informal atmosphere of Namizimu.